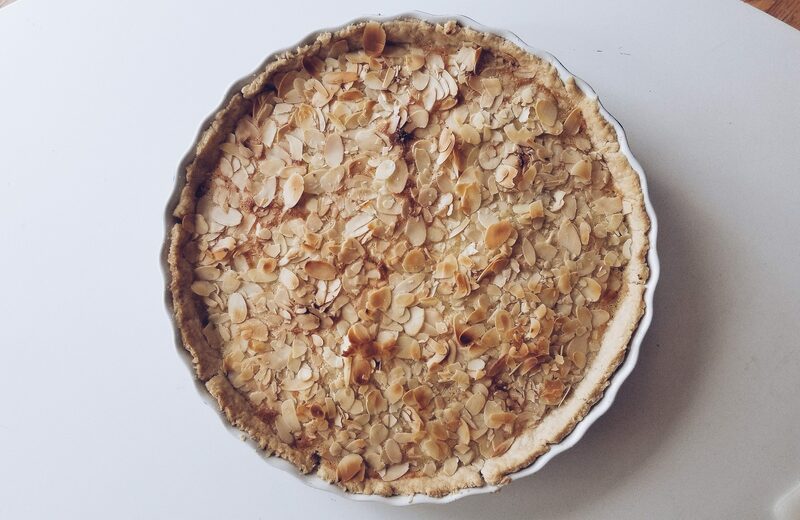 Holiday Baking: Apple Frangipane Tart | Pinch. Plate. Party. It’s officially the holiday season and you know what that means, it’s time to step your baking game up. Heading into Thanksgiving I had some leftover apples and slivered almonds and I wanted to use them in a unique dessert for Thanksgiving. The end result ended up being this Apple Frangipane Tart. I adapted this recipe from the BBC recipe. This dessert comes together in less than 10 minutes and bakes in 25 minutes. It’s simple to whip up and is sure to impress! An apple and almond flour custard baked into a simple tart. Notes: Use your favorite pie crust for this recipe. Pre-made refrigerated roll out pie crust is easy and taste just as good as from scratch. Roll out pie dough into a 12 or 13 inch round (as much needed to fill the bottom and sides or a tart pan). Transfer dough to tart pan and cut off any access overhand. Keep refrigerated until you assemble the tart. In a bowl whisk together sugar and butter until combined. add eggs, one at a time, to the butter and sugar mixture. Whisking until well combined . Add almond flour, extract, and rum to the wet ingredient mixture and wish until well combined and “fluffy” looking. Layer the thinly sliced apples on top of the dough. Pour the wet ingredients over the layered apples. Top with the slivered almonds . Bake for 25 minutes until the tart is set. If the almonds aren’t golden, placed them under the broiler for a few seconds (keeping your eye on the tart so it does not burn). Let sit for 15 minutes before serving. Best served warm with vanilla ice cream. ← Previous Post NORTHERN CALIFORNIA: 2 People. 4 days. $500 a Person!